However, many people in leadership positions often act like – and perhaps believe – they know everything, they are skilled in everything, they are good at everything, and they both know all the answers and all the questions. The harm this does to their teams is immeasurable and often leads to disastrous consequences. Quintessential leaders are starkly different and they have distinctive attributes that set them apart. One attribute that quintessential leaders have is that they don’t believe in one-size-fits-all solutions. While there may be similarities in situations, things, and people, quintessential leaders understand that each of these has unique characteristics that need to be factored into to the equation. Because of this, quintessential leaders are naturally good listeners and they ask questions, as opposed to hearing what they think someone is going to say and jumping to conclusions and giving an answer and walking away convinced the problem is solved (this is the epitome of disrespect, pride, and arrogance when it happens). Quintessential leaders take whatever time is required to work with their team members to both understand and to coach and guide them interactively toward a successful answer. It’s an investment that quintessential leaders are willing to make, even though they may be busy and have other pressing matters. In the end, quintessential leaders understand that their time is best spent with their most valuable resources: the people on their teams. Another attribute that quintessential leaders have is thoughtfulness and customization of solutions. Quintessential leaders don’t rely on parroted mantras, cliches, and untested and unproven ideas of other people – who may or may not know what they are talking about – to address real problems. Quintessential leaders recognize that mantras and cliches, as well as “official” advice from others is often the product of people with no actual experience in dealing with the situations, issues, or problems at hand. To use them is dismissive and shows a lack of care and concern for their team members because these trite, non-thinking answers end up making whatever is going on much worse. A third attribute of quintessential leaders is that they openly admit the things they don’t have experience, knowledge, and expertise in, but they work with their team members to guide them toward knowledgeable and experienced resources who do have the expertise. This is critically important, especially when we’re dealing with situations and things that may involve health (mental, physical, and/or emotional) and other personal matters that are impacting our team members (and possibly their performance or their ability to focus or even be present). To assume this role of expert when we are not is not only dangerous, but it is also an indication that we don’t really care about our team members and we’re willing to put them at incalculable risk by our own foolish – and wrong – sense of being the end-all of and for everything. A fourth attribute that sets quintessential leaders apart is that we’re willing to go the distance with our team members, no matter what they face or how much it may burden or inconvenience – and, all difficult situations do with time – us personally. Quintessential leaders are invested in and with their teams. They recognize that when one person on the team is facing challenges, it affects the entire team in every way. Because of this quintessential leaders will roll their sleeves up and go through the trenches of hell with their team members to help them through whatever difficulties they face with endurance, patience, and kindness along the way. We all have to look into the mirror of our own lives as we strive to be quintessential leaders, understanding that none of us are there yet, but that is our goal day-in and day-out and it’s on our mind continually, reflected by our thoughts, our words, and our actions in everything we are, we say, and we do. Have we fallen into the one-size-fits-all mindset for problem-solving? Have we given up critical thinking and customization for each unique situation, thing, and person in favor of parroted mantras, cliches, and the untested and unproven ideas of other people? Have we come to believe that we are experts in everything – and everybody – and have the experience and knowledge to fix all the things that our team members do and will face during their tenure with us? Are we willing to go the distance with our team members, no matter what? The answers to these questions will reveal our degree of self-awareness, how much of the narcissism of society around us has become part of who and what we are, and what we value most. They may not be the answers we hoped for, but asking the questions gives us the opportunity to consciously and actively change those answers for the better for our teams. Very good post. 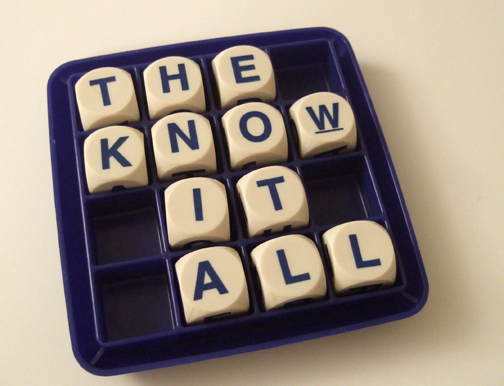 Have found many people through my lifetime who think they know it all. I know there has never been anyone on this earth who knows it all. It is good to work with others and to share ideas and strive to be the best you can. As a leader you do need to have compassion for others and show love to your team members. I think people have so many problems in their lives anymore, that all they do is focus on themselves. Everyone has problems and everyone needs help at times to become a better person. I agree. We’ve become so enamored of ourselves – and technology has made this more pronounced – that we have been deceived into thinking we’re all that and nobody else is (and, therefore, they are not worth our time, our investment, our compassion, and our help). It’s a sad, but true, commentary on the state of the human race, in general.